A great 16.2 mile ride with fast trails, great views, and maybe the occasional bear. You know you’ve hit the singletrack jackpot when mountain biking feels more like flying. Trees become a peripheral blur as you lock into the flow of the trail, blissfully focused on sensation of speed. You and your bike are one, floating through the wilderness. If this is your idea of 2-wheeled nirvana, then Boulder’s Betasso Preserve will serve as a worthy shrine. Betasso’s single track trails blend into vanilla-scented pine forests, with open sections of mountain-meadows and a few quiet stream crossings. Fast sections are silky smooth and flow in perfect harmony with the land, while the climbs sustain moderate angles -- just enough to shrivel the lungs of riders hoping to hammer up. There are plenty of pockets of euphoric downhill that ease into fast, flat sections and the looped trails ensure you can work on getting a little quicker on each lap. When the Boulder Mountain Bike Alliance (BMA) set their sights on improving Betasso’s riding potential, they did so with some of the best trail designers in the country. For many years, the original Canyon Loop Trail was the only rideable trail at Betasso. A fun, quick 3.2 mile loop, it was a great place to get in a few laps to burn out your legs and lungs. The addition of the 2.4 mile Benjamin Loop in 2011 gave serious added value to Betasso. Along with the .75 mile long two-way traffic trail that connects the two loops, the amount of terrain was doubled -- all while keeping the same fun, fast, slightly technical aspects that defined the original Canyon Loop. And for the locals’ benefit (or anyone wanting to ride from town), two new connector trails were built to offer access from nearby roads. The 1.2 mile Canyon Link Trail connects Boulder Canyon with Betasso and is the most technical terrain in the network. Loose rock, a few burly roots and a couple of 1-foot drops harken back to the trails’ origin as a rogue route. There is one section at the start of the climb that will be a hike-a-bike for all but the strongest riders, but after that, the trail is challenging yet rideable (and makes for a fun descent). The Fourmile Link is a 0.8 mile trail that connects with Fourmile Canyon and is less difficult than the Canyon Link, more in the style of the Canyon Loop/Benjamin Trails. The bottom line is that you can enjoy a quick spin at Betasso or make a full day of it. Because it is fun for experienced riders but not overwhelming for casual cruisers, it is a great spot to invite riders of all abilities. And if anything goes awry, the trails are loops so you’ll be able to check in on one another even if you get separated. Beginners will appreciate the modest but brief rocky challenges that make up about 10% of the total terrain -- most of the riding is going to be fast, fun and unintimidating. Regular riders will love the sheer speed and aggressive climbs, not to mention the technical opportunities in the Canyon Link trail. And everyone is going to love the spacious views and remote feel of the wilderness. Betasso is closed to mountain bikers on Wednesdays and Saturdays -- a perfect time to throw on the running shoes, grab your dog and get in a peaceful trail jog. The official trailhead is 5.4 miles from downtown Boulder, measured from the intersection of Canyon and Broadway. Drive west into Boulder Canyon for 4.4 miles and turn right onto Sugar Loaf road. Go up this steep, paved road for 0.5 miles and turn right onto Betasso Preserve Road. Follow this road 0.5 miles to the Betasso Parking lot on the left (north) side of the road. This is the Canyon Loop Trail -- the connector over to the Benjamin Loop is 1.5 miles into the Canyon Loop Trail.There is an unofficial parking lot suitable for 4-5 cars located 3.8 miles up Boulder Canyon on the right. This pull off, just before a tunnel, is the start of the Boulder Canyon link trail. Many locals will ride from town along the Boulder Creek path trail to reach this starting point (a 1 mile section of Boulder Canyon must be ridden to reach here). The Fourmile Canyon Connector has no formal trailhead, but can be reached by turning off Boulder Canyon at mile 3.1 to Fourmile Canyon Road and riding another 3.6 miles to the Fourmile Connector Trail on the left. 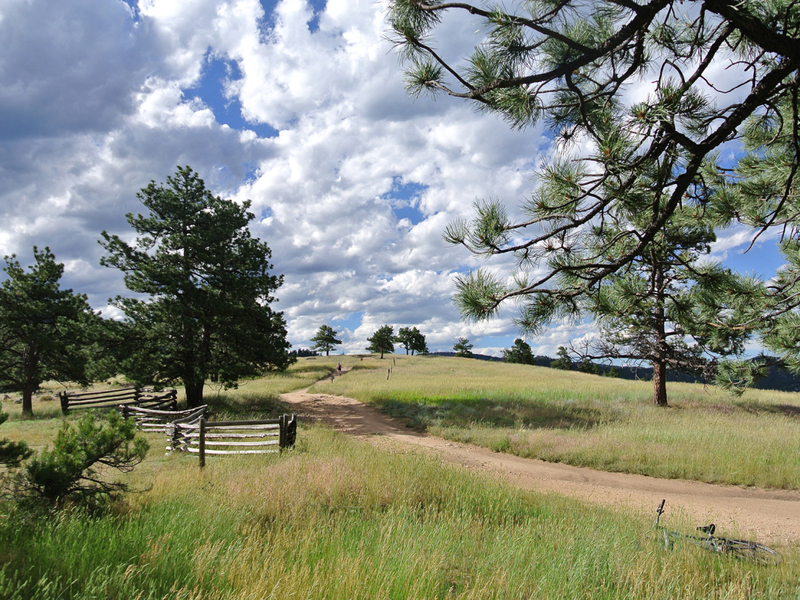 The trail is rideable year round, but please check Boulder Mountain Bike Alliance’s trail conditions page in case of excessive mud or closed trails.